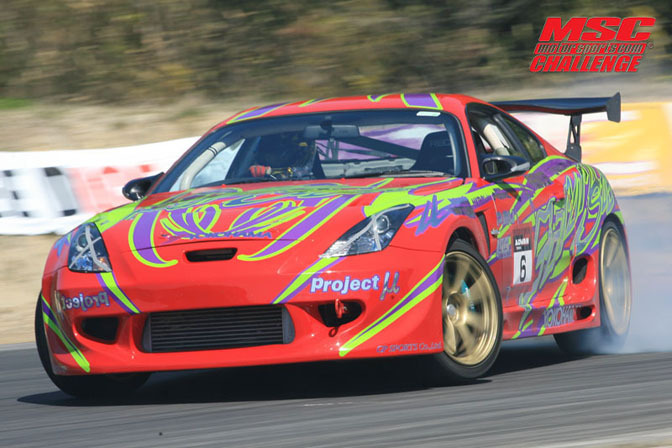 Yesterday we took a look at some of the cars seen in Japan's top level D1GP series but now it's time to take a look at the other side of the Japanese drift spectrum. the MSC Challenge series. Since MSC is a grassroots level series filled with privateer drivers, you have to look at the MSC cars from a different viewpoint than the pro level cars seen in D1. MSC events are held at all corners of Japan from Kyushu in the south to Hokkaido in the north, so few or no drivers compete in every event. Because of this, you also get a wide variety of cars depending on the region the event is being held in. I will try to show some of the more interesting and unique cars seen at MSC events as well as some of my personal favorites from the series. Of course most of the cars in MSC are not built to the level of current D1GP cars. Actually, many MSC cars do bear a striking resemblance to the the cars seen in D1 during the early days of 2001-03. You won't find many insane engine swaps or brand new cars converted for drift use, but you will see a lot of homebuilt street legal cars that are driven to and from the track and worked on by the driver or a group of his friends. As expected, the Nissan S-chassis is the most commonly seen car in MSC Challenge, as it is in other drift series around the world. The S13 and S14 models in particular are very popular with a good number of S15's representing as well. 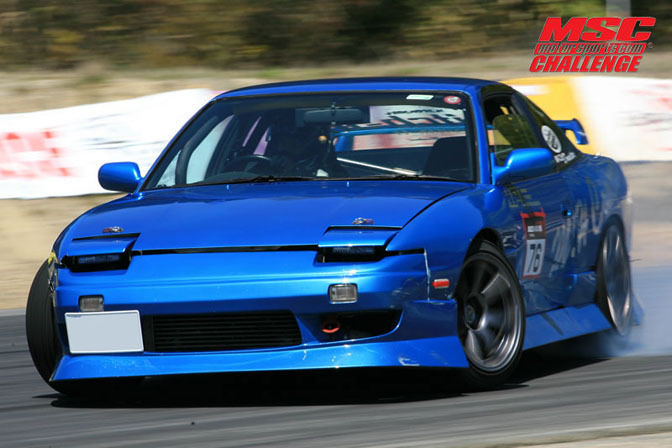 This blue 180SX is very typical of a lot of S-chassis seen in MSC. The look is fairly simple with no crazy graphics and the body shows plenty of signs of drifting use. Power numbers are typically lower than the full pro cars with many running mildly tuned SR20's in the 280-380ps range. 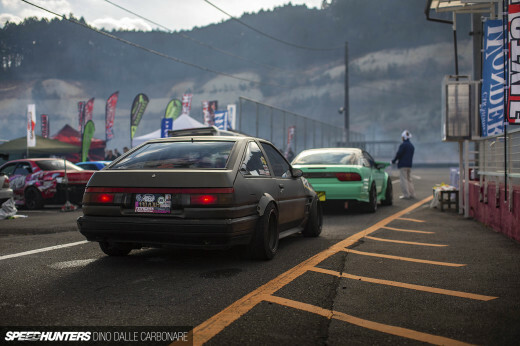 The AE86 also sees a lot of love from MSC competitors. 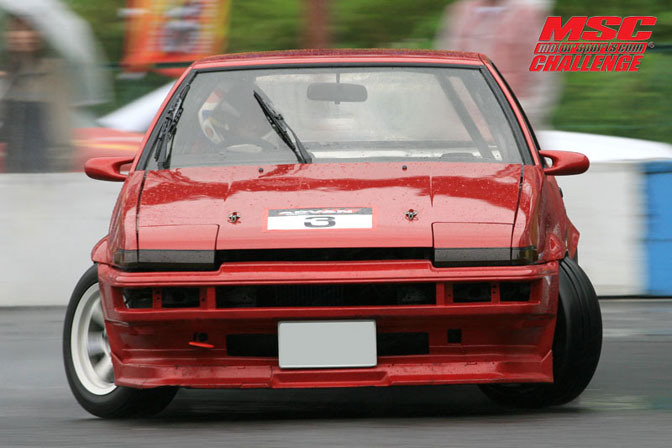 This red Trueno is typical of the AE86's seen in MSC. There are no gigantic wheels, no GT wing, and no crazy turbocharged engine swaps. Most of the 86's in MSC stick to their NA 4AGE roots. The chance to see "traditional" drift cars give MSC a strong following in Japan and somewhat of a cult following outside of Japan. Then again not every car in MSC is traditional. 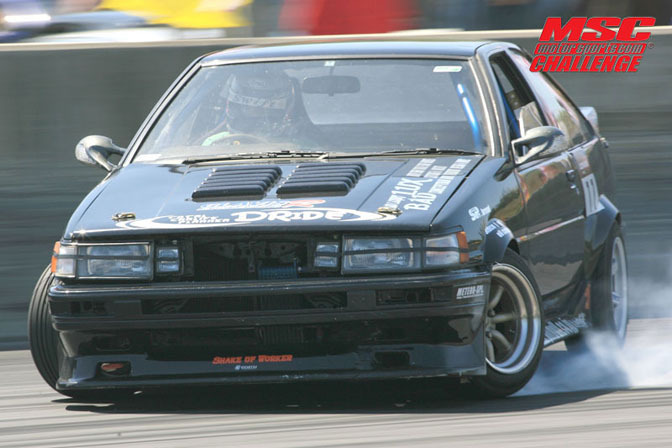 This JZA80 Supra with a Celica front end conversion is a recent addition to MSC and also sees action in the D1 Street Legal series. Actually there are more than a few cars that compete in both in MSC and D1SL. As for this Supra, I actually think the Celica front end looks pretty cool but I do think this car looked better before it had the funky red and green livery applied. On the opposite end of the spectrum from the Celica-Supra thing, you will find some extremely "boro boro" cars like this TE71 Corolla sedan from Motor-Fix. 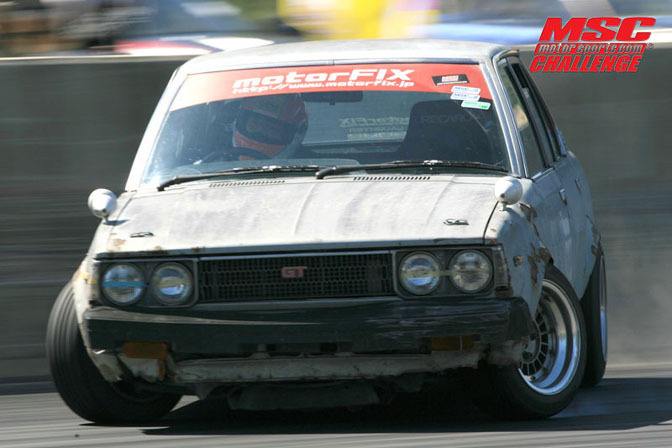 This car is one of a number of 70 chassis Corollas from Motor-Fix that compete in MSC events. They are all powered by variants of the 4AGE and put down some of the most exciting drifting I have ever seen anywhere, grassroots or otherwise. This variation in car styles makes MSC very fun to watch. This S15 is one of my favorites in MSC. While I love the wilder cars also (I'll get to that in a second), there is something about this car's combination of aggressive aero and wheels with a subtle single color and stickerless exterior that make this car look fantastic. This car just does a great job of improving on the S15's already good looks. It is also interesting to note the lack of large intercooler in the bumper of this car. While rotary-powered cars are not a super common sight in MSC, there are still a fair number of them to be seen. This FC3S has a nice look to it with its aero and wide fenders. Cars with missing bumpers and other aero parts are plentiful in MSC given the ultra low Shakotan style that many drivers are running. 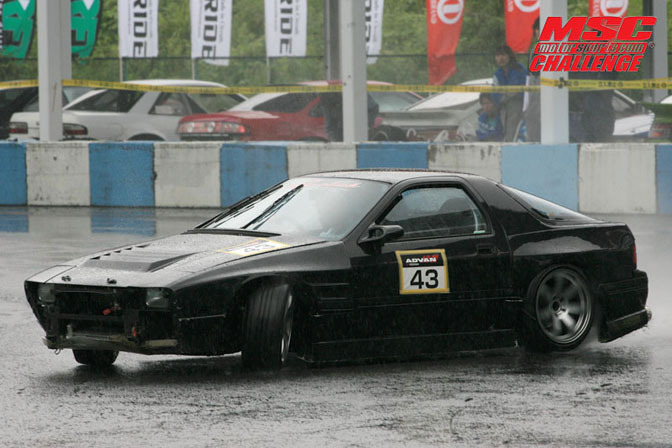 After all, a big part of drifting is how cool and dramatic your car looks while doing it right? As expected there is a large number of four-door sedans to be seen in MSC. This blue C33 Laurel is a fine example of the breed. Typically these C33's are running tuned RB25's if not SR20 swaps. This particular car actually looks to be in very good cosmetic condition as far as grassroots level drift cars go. You can't help but love the boxy styling of these cars. MSC also draws its fair share of strange drift machines. This front wheel drive K11 Nissan March is actually one of a few "F-dori" cars seen in MSC. Besides this, there have also been a few MSC drivers competing in Civics and Integras, as well as various kei cars. I'd say this March looks pretty cool with its vintage Hayashi Street wheels. Some people hate the idea of front wheel drive cars trying to drift, but I don't have a problem with it as long as the driver makes it fun to watch. There are not many FD3S RX7's seen in MSC, but this mean-looking yellow one more than makes up for it. I love the way the blister kit looks in combination with the wheels. While you might expect to see a GT wing on a car of this caliber, you won't find one here. Then again the layout and speeds reached on most MSC courses don't require GT wings. Of course it is also riding quite low as with many other MSC cars. 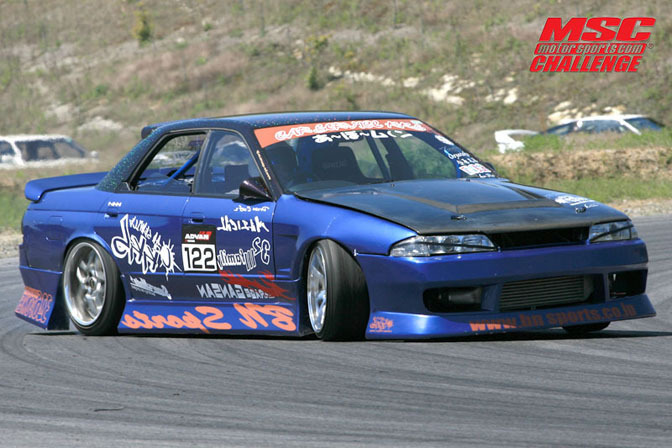 Speaking of low ride heights, few cars in MSC (or any drift series around the the world) ride lower than the R32 Skyline sedans from the drift team "Abou Moon". Check out their triple car drift in the opening shot of this story. These are some of my favorite cars in MSC and they have made the 32 sedan eternally cool. I could probably do a whole separate post on these cars. 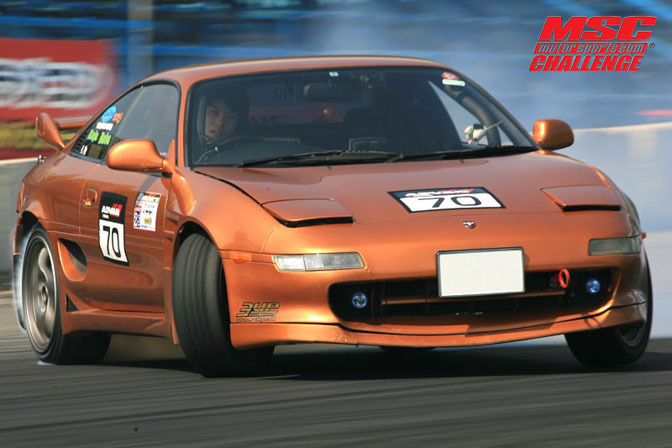 It is very rare to see the SW20 MR2 being used for drifting and many have said that it the driving dynamics of these cars are too unpredictable to make a good drift cars. This guy appears to be proving them wrong. The car actually looks to be fairly stock on the outside and the number plate on the front shows that it also sees some street use. Quite an interesting body color on this car as well. You probably remember this GX71 from my coverage of the FLUKE drift day at Nikko last month. Just another example of the cool stuff that can be seen driving in MSC. As evidenced by its exterior condition, this car has a very aggressive drift style and the its 1JZ engine swap makes sure it has plenty of power to destroy the rear tires. I'm loving the roof rack on this car! This RX8 from JIC Magic is a recent addition to MSC and is by far one of the more "pro level" cars in the series. The driver of this car is Koichi Yamashita of Running Free AE86 fame. 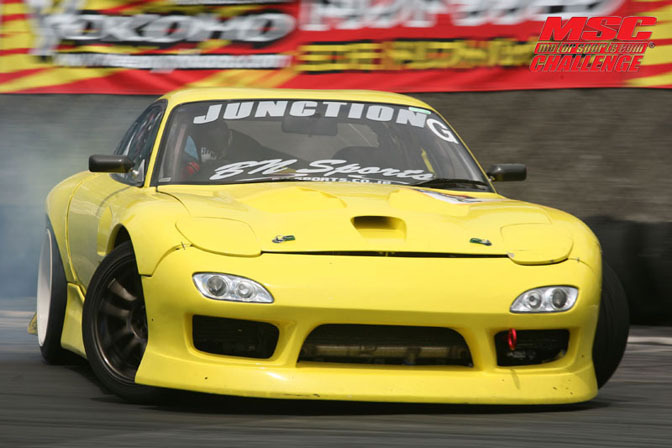 He won the Expert Class at this year's Ebisu MSC round in this car. 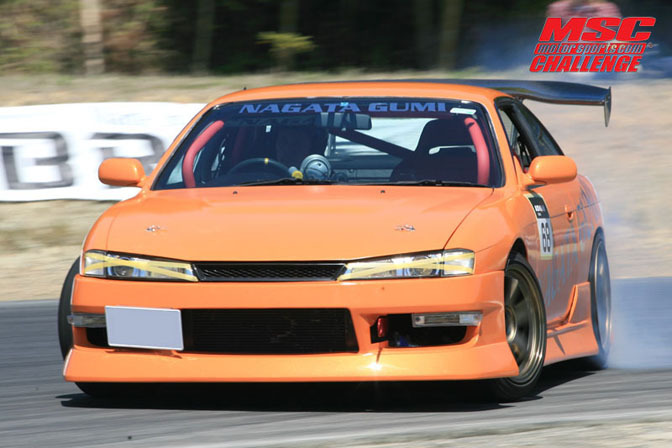 If I am not mistaken, this is the same car that was seen in D1GP a couple years back in a different color scheme. Man the Vertex Lang aero for the RX8 looks great doesn't it? The Celica GT-Four saw plenty of sideways action during its rallying days, but I haven't seen many being used for drifting. I wish I could find some more info about this car. Judging by the photo it looks to be doing quite well. I'm very curious as to what sort of modifications this car is running. Hopefully we will be able to see this car in action for ourselves during one of the MSC events later in the year. 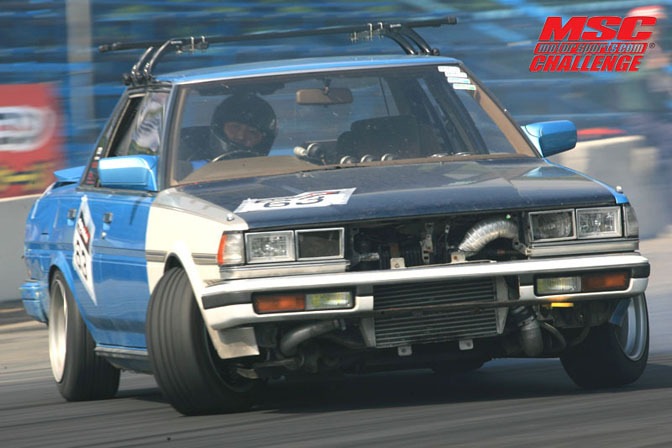 One of the most eye-catching cars in MSC is the JZX110 Mark II from Chiba Prefecture's Team Magician. Having a blazing coat of pink flake paint will tend to do that. Look at the pull that has been done on this car's OEM fenders. The cars aggressive exterior style is also due in large part to the BN Sports aero. Of course the fact that JZX110's are fairly rare to see in general also makes this car stand out. 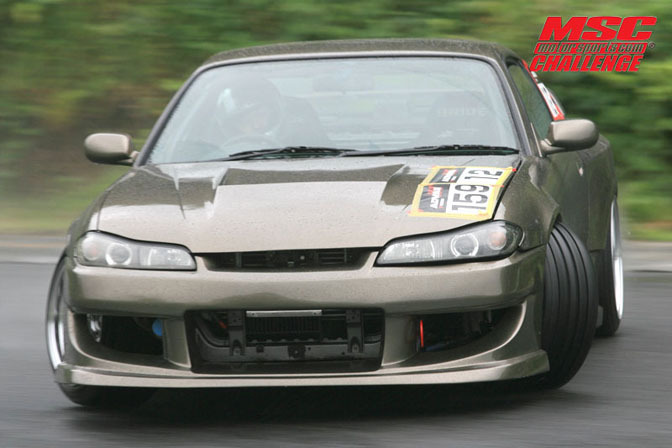 This kouki S14 Silvia is one of many S14's seen in MSC. Despite its gutted interior and full roll cage, the number plate shows that this car still sees some street use. That is actually something I have noticed about Japan compared to the United States. 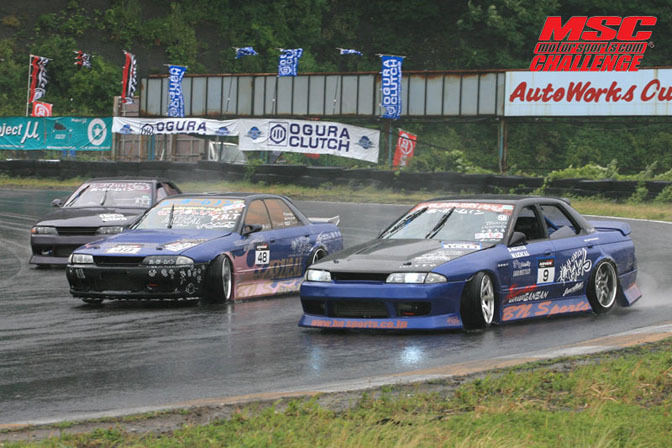 The number of track-only cars seems to be much lower in Japan whether it's drifting or grip. Probably because getting your car to the track is much harder than just using your pickup truck and a trailer. 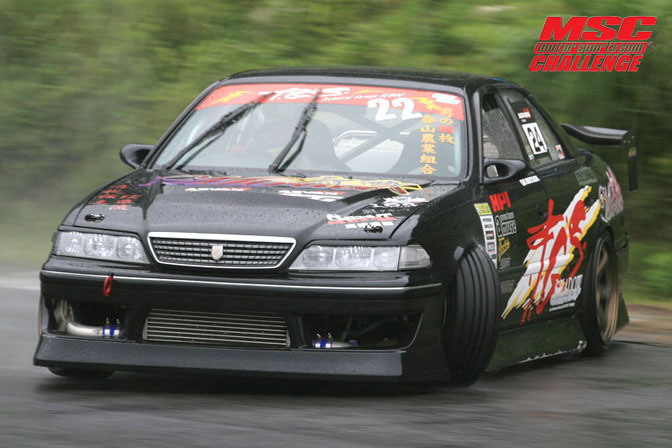 This JZX100 Chaser is from Team Spirant and has to be one of the best looking Chasers ever. This car's looks have been constantly evolving and the latest addition is the ZG style over fenders seen in this photo. The idea of using a 1970's over fender design on a modern sedan may seem strange in theory, but in actuality it looks really damn cool. This photo all does a nice job of showing the insane amount of steering angle this car has. Another JZX here with a slightly more understated exterior. The JZX90 Mark II is still one of my favorite body styles of the whole JZX series and this car shows why. Something about how the rear roof line flows into the trunk makes these cars look really good. Just more reason to be bitter that none of these fantastic cars were ever offered for sale in the United States. 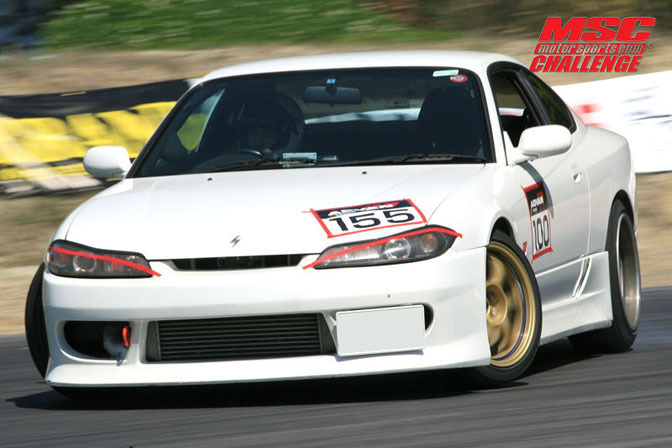 This S15 Silvia is a good example of the sort of S15's seen in MSC. I'm sure you will notice the differences between this type of car and the S15's seen in D1. Of course it also a street car like most MSC machines. In my view the S15's factory styling is aggressive enough that they only need minor modifications to look absolutely stunning. 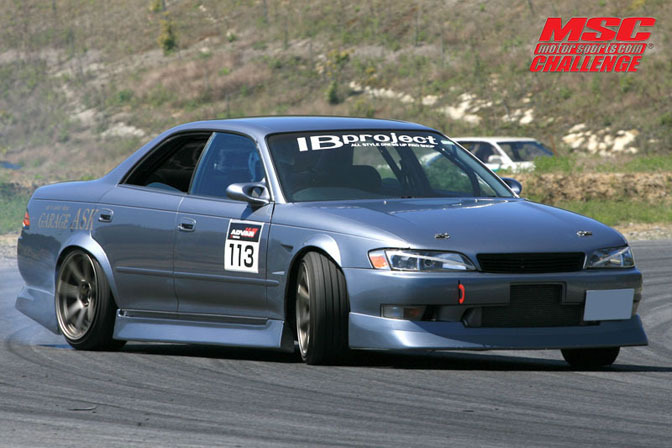 In my opinion a lot of the S15's seen in recently in D1 and other pro drift series a little too busy, but then again they are pro cars. Another really cool JZX from MSC. This particular car is a JZX100 Mark II. 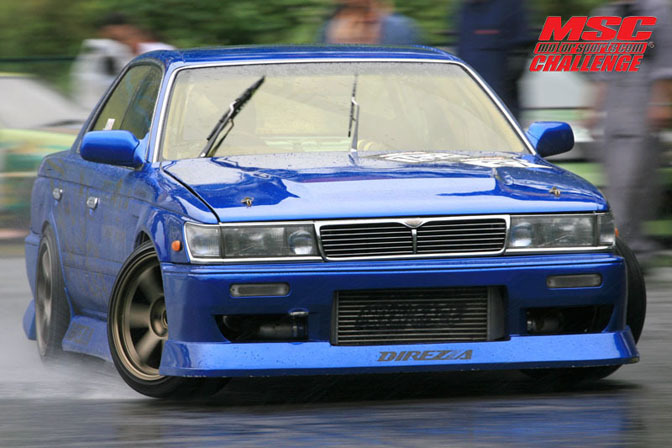 Since they appear so often on Speedhunters, I'm thinking maybe a separate post about the differences between the various JZX models may be in order. What do you guys think? At the very least it will give me a chance to post up some more of my cool JZX photos. And why not finish things up with this AE86 Levin getting some four-wheel lock. Everything about this car just screams Japanese grassroots drift style. The vents on the hood look to be a DIY modification and the car is also rocking a nice combo of low offset TE37 and RS Watanabe wheels. The drift team that this Levin belongs to is called "Shake of Worker". Just tell me that isn't the coolest drift team name you have ever heard. 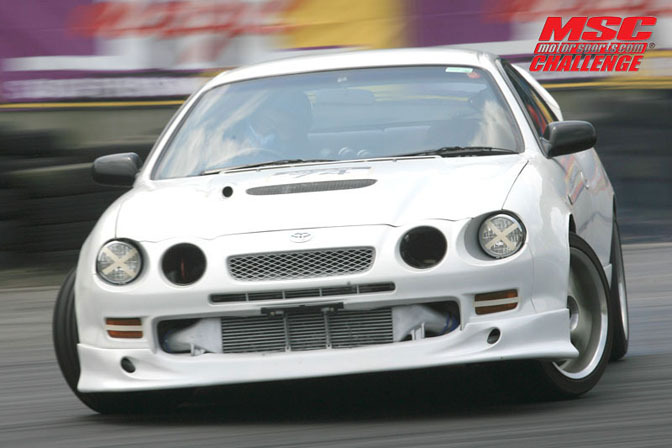 That should give you a decent run down of the type of cars commonly seen in both the MSC series and the grassroots Japanese drift scene in general. There are tons more photos on the MSC site if you want to see more. FC stylee....I love the angle and black paint on it. Mike u always come through with the clean content of grassroots driving. Finally, the grassroots drivers get some attention. And what attention at that! It's nice to see not everyone is just drawn in by the flash of high-money professional drift cars. I agree. We need a JZX feature of some sort. I agree. Motor Fix and the GX71 (or any boro boro cars, beat up in other word) are just awesome. The driver clearly drives it to the fullest, just the way it's suppose to be. 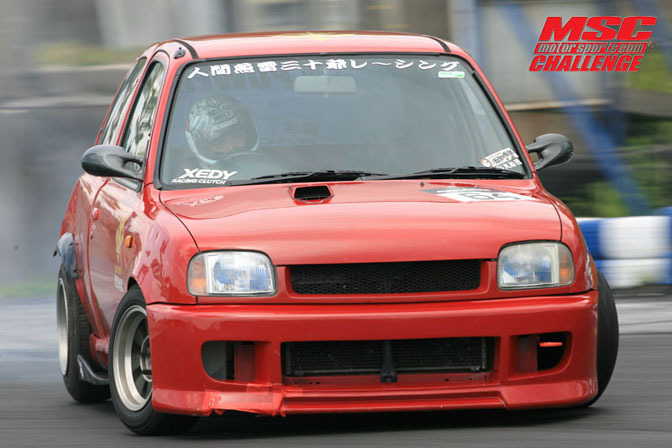 I never seen a Nissan March (Micra in Europe) in any drifting competition. I've seen some KP70 with 4AG's...but that's about it. It would nice to see some March with a RWD conversion. We need a JZX feature. I've never seen any Micra "RWDed", but there is some video on youtube about a Toyota Corsa (no not an Opel), CA18DET swapped and with RWD conversion. It looks hella nice sideways and its a really original car (I think its the only one in Japan). Wow, great coverage on the grassroots car, we need more stuff like this! MOAR!!!! And yes to exlusive post to Chasers! Bring on the JZX post please! And yes, it is a damn shame we never got those in the U.S.
Could you please do a brief write up on motorfix mike? Those guys are awesome. Some real talent there, and the cars are so yum! ...Sw20 MR2s/mid engine cars are drift able, there just balanced so well, theres a much finer line between under doing it, or over doing it, more difficult to get the balance, due well balanced via engine location, and excellent rear wheel traction, hence more difficult to let the rear let go some, compared to a front engine car!. This is the second year I've been "following" the MSC now and I honestly like it more than the pro-competitions. Great post Mike! nice pics u posted man, i went to MSC event this year at Okayama, my friends from Total Car Produce magic entered the event. They are entering D1 next year as well. A lot of these cars are top dollar so dont let MSC fool you!!! my buddies FD is well worth over 120k!!!! Sorry to comment out on such a old feature but that Levin's vents is actually a bonnet/hood produce by TBO!